"Customers love the flavor and natural ingredients." "This sugar-free mix reduces the calories while providing an authentic flavor." "It’s a concentrate and you add your own water." "Taste exactly like the liquid version, but are better for travel." "Natural agave and orange sweeten this mixture." "The mix includes ghost pepper extract to give it a kick." "Includes six “shot pods” of margarita mix along with a mini cocktail shaker." "Packed with six different flavors including mango, blood orange, and more." If you love the flavor of fresh ingredients but don’t want to squeeze enough limes for a crowd, this organic mix has you covered. The ingredients are simple, so you won't see any mystery ingredients on the label that you won't be able to pronounce. With only 68 calories and 16 grams of sugar per serving (it's only sweetened with agave nectar), you can indulge in a margarita or two without feeling guilty. This includes two 1-liter bottles of the mixer in glass bottles. Many customers noted that this is more expensive online than their local stores because of the shipping costs, but they happily buy online if local stores don’t have it in stock. They’re willing to pay more because they love the flavor and natural ingredients that make their margaritas the best in the neighborhood. You can’t take all of the calories out of a cocktail, but this sugar-free mix only contains 10 calories and 3 grams of carbs while still providing the authentic flavor you’re looking for. Because it's gluten-free and has zero sugar (it's sweetened with Sucralose), it will fit many diets and lifestyles. Many reviewers were happy that they could still indulge in a delicious drink while on their low-carb, low-calorie, keto, or Adkins diet plans. While users across the board loved the flavor, a few noted that it was a bit more tart than other mixes they've tried. Made for commercial machines but just as handy for home margarita making machines, this slush mix syrup saves you money since it’s a concentrate and you add your own water to get it to the proper strength. It’s formulated to create the perfect slushy consistency every time when you mix one part syrup to three parts water for a virgin cocktail or substitute tequila for some of the water for an alcoholic version. If you don't want to use the slushy machine, you can also use this mix to make your margaritas in a blender. Add crushed ice instead of water and blend to the proper consistency. Or freeze it (with added water) in your ice cream maker for even more fun. Baja Bob makes another appearance on our list with their Original Sugar-Free Powdered Packets, which taste exactly like the liquid version. While liquid mixes might be easier to combine, powdered packets are convenient for travel and they're easier to store. Large bottles of liquid may be difficult to store in the refrigerator, especially after a party when you are storing leftover food as well. Each packet makes 64-ounces of margarita mix, which is roughly eight cups. You can empty one packet into a pitcher of water, or combine 4-ounces of the mix with tequila, ice, and a splash of cranberry juice for a delicious cocktail at home. With 10 calories per serving and zero sugar (it's sweetened with Sucralose instead of sugar), feel free to indulge in this classic drink. 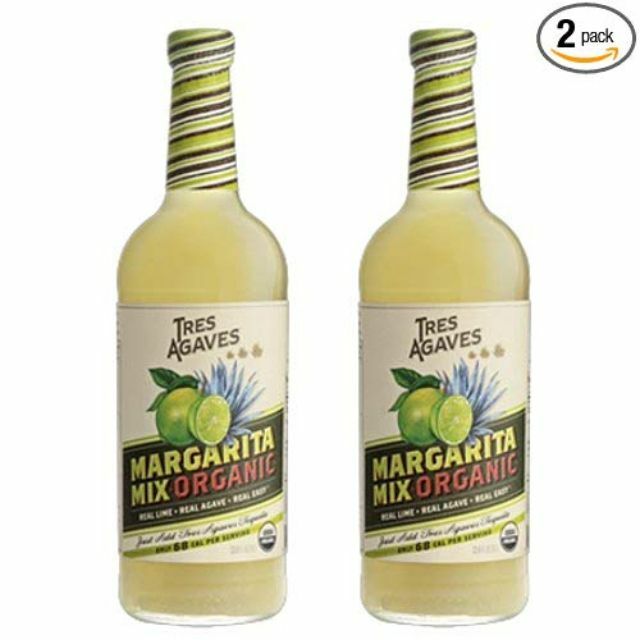 Many users love the sweeter flavor of the Mr & Mrs T Margarita mix because they don’t need to add sugar or agave to tame the lime tartness that's common in most other brands. The 5.5-ounce cans are also convenient because you can open one can and drink it in a setting. You won't have to worry about having an open bottle that requires refrigeration or quick consumption before it goes bad. When you’re serving a crowd, larger bottles of this same mix are available. Agave is the main sweetener in this mix, but it also includes notes of orange and lime to soften the tartness. If you’re looking for new ways to use this mix, the company offers recipes for making a mai tai or strawberry margarita along with a classic margarita. The first flavor you think of with a margarita is probably the tartness of lime or perhaps the saltiness of the rim, but Hella has added a twist to the standard mix with ghost pepper extract. It was inspired by a bar in a Mexican beach town, and it still has the classic tart flavors of a classic margarita, but with a kick that will satisfy folks who want to spice up their cocktail as well as their meal. This mix still uses cane sugar to add the right amount of sweetness and finishes with the tart flavor of lime. Another benefit? This mix is all natural, vegan, and gluten-free. Just remember to refrigerate after opening. Great for a gift, this includes six “shot pods” of margarita mix along with a mini cocktail shaker. The shot pods keep each serving fresh, so you won’t end up with a giant pitcher of mixer taking up space in the refrigerator. The pods also serve as measuring tools, so you don’t need to hunt for a jigger. Just combine the mix, one shot of water, and one shot of tequila to make the perfect margarita. The mix is gluten free and contains no added flavors or preservatives. It is also GMO-free and certified organic. Besides using this to make margaritas, the manufacturer suggests using this to make a Daiquiri by adding white rum, or you can use gin and club soda to make a gimlet. Classic margaritas are always delicious, but it can be fun to mix it up with a more unusual flavor like strawberry or mango. This kit makes it simple to experiment with different flavors as the box comes with six different flavors including mango, blood orange, blue lagoon, strawberry, and peach. Each bottle makes one cocktail, so it’s great for sampling to see which is your favorite. This gift basket is also fun to have on hand for outdoor barbecues and parties so guests can choose their favorite flavor. Six palm tree drink stirrers are included to add a little extra fun to your cocktail. Customers note that this makes a great gift for your resident margarita lover. Our writers spent 2 hours researching the most popular margarita mixes on the market. Before making their final recommendations, they considered 16 different mixes overall, screened options from 12 different brands and manufacturers, read over 8 user reviews (both positive and negative) and tested 2 of the mixes themselves. All of this research adds up to recommendations you can trust.